This post is primarily applicable to those people with a limited download broadband connection with unlimited transfer during specific hours of the night. I have broadband plan with unlimited downloads during 2 AM to 8 AM. I will be sleeping during this period. I want my PC to start at 2 AM, do my torrent downloads and shutdown at 8 AM without even a single keystroke. 1. Starting the PC and torrent download. 3. Shutdown/hibernate PC after download, only if I am sleeping! This will work in Windows XP / Windows Vista / Windows 7 with minimal tweaks. Actually, this is applicable to Linux also, but with different tools. New PCs (I mean, less than 5 years old) have capability to boot automatically at a specific time. Some even allow this directly from the BIOS. If not, Windows supports this as part of Task Scheduler. - Click Start, click All Programs, point to Accessories, point to System Tools, and then click Scheduled Tasks. 2. Create a new task. - Click "Add Scheduled Task"
- Check "Open advanced properties for this task when I click Finish". Click Finish. If any Warning shows, just click OK.
- In "Task" tab, check "Run only if logged on". - In "Settings" tab. 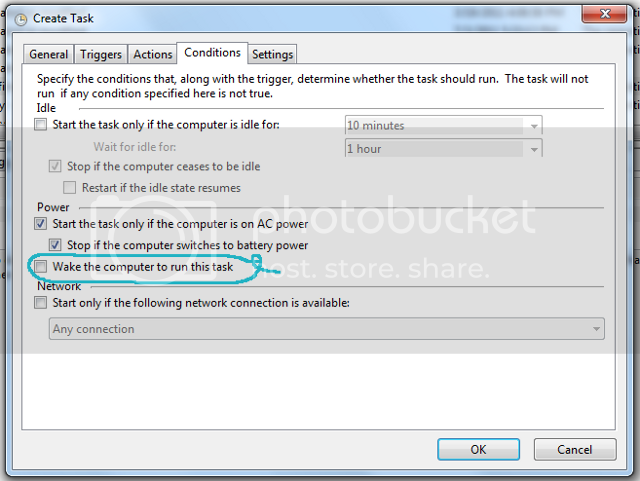 Under "Power Management", check "Wake the computer to run this task". - Go to General tab. - Check "Run only when user is logged on." - Choose Action as "Start a program"
- Check "Wake the computer to run this task"
- Go back to the scheduled task and set the start time as 2 minutes from current time. - Save and hibernate the PC. - Wait 2 minutes and see if the PC starts up again. - If it doesn't, go back and verify all the steps. Go to Options -> Preferences (Ctrl+P) From the menu on the left, click "Scheduler". The cells represent a time slice across the week. We are going to make sure that downloads happen only from 2 AM to 8 AM everyday. - Click on all the cells on the columns 3 through 8. Each column maps to a hour in the clock, starting from midnight. Green cell means full speed download and white cell means no download. Make the schedule by changing all the needed time slices to green. It should look like the snapshot below. I have made sure that download happens only between 2 AM and 8 AM. Then why should the PC be on at other times? I am going to hibernate the PC when the download is done. Note: If we are going to shutdown, then we can use the timeout feature of shutdown command. @echo off setlocal enableDelayedExpansion for /l %%N in (600 -1 1) do ( set /a "min=%%N/60, sec=%%N%%60, n-=1" if !sec! lss 10 set sec=0!sec! cls choice /c:CN1 /n /m "HIBERNATE in !min!:!sec! - Press N to hibernate Now, or C to Cancel. " /t:1 /d:1 if not errorlevel 3 goto :break ) cls echo HIBERNATE in 0:00 - Press N to hibernate Now, or C to Cancel. :break if errorlevel 2 (%windir%\System32\rundll32.exe powrprof.dll,SetSuspendState Hibernate) else echo "Hibernate Canceled"
Note: If you want to shutdown the PC instead of hibernate, just replace '(%windir%\System32\rundll32.exe powrprof.dll,SetSuspendState Hibernate)' with '(shutdown -s -f)' in the script. - Instead of "uTorrent.exe", choose "hibernate.bat"
- Uncheck "Wake the computer to run this task"
Tip: If you need to connect to the internet using a command or executable, you can schedule that also same as utorrent in Task Scheduler. » Speedup Windows XP without Reinstalling, in 10 minutes!!! this is a nice post, and was very helpful for me! For you I have useful information, I found the boot file of utorrent 64 bit windows 10 https://yepdownload.com/utorrent. And I will be happy if it also be useful for you. It's very convenient for me personally, I can upload movies and watch my favorite TV shows.